I've been silent on this page lately, for a while now. I don't know why, except that it's been a busy season of hurricane relief and now vacation, and I'm on my phone mostly, which allows me to post to Facebook but not to Blogger. UGH. There's more posted on Facebook, and although I know that many people don't use Facebook, many still do. I don't have an opinion on that topic. Well, I do, but it doesn't matter to me whether or not you have an account there, I'll try to keep posting at both places (for the time being). I also have an Instagram account going for Marina's Kitchen Table, and you may be interested in seeing the posts there too (although they are similar to Facebook posts). None of that really matters, except to let you know that while I may be out of the loop here, I do keep those other spots updated more frequently. 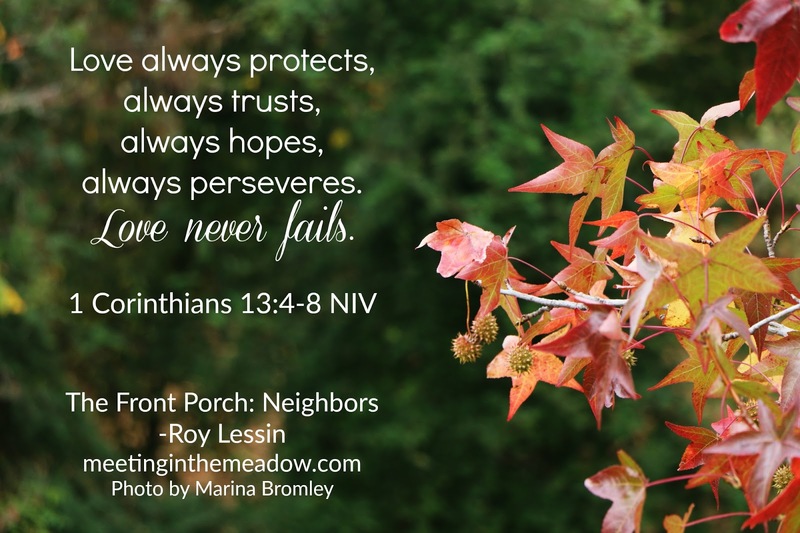 I'm continuing to work with Roy Lessin over at Meeting in the Meadow too, both on Facebook and now on a blog page called "Meeting in the Meadow." We are currently posting twice a week at both spots, with the same content both places.